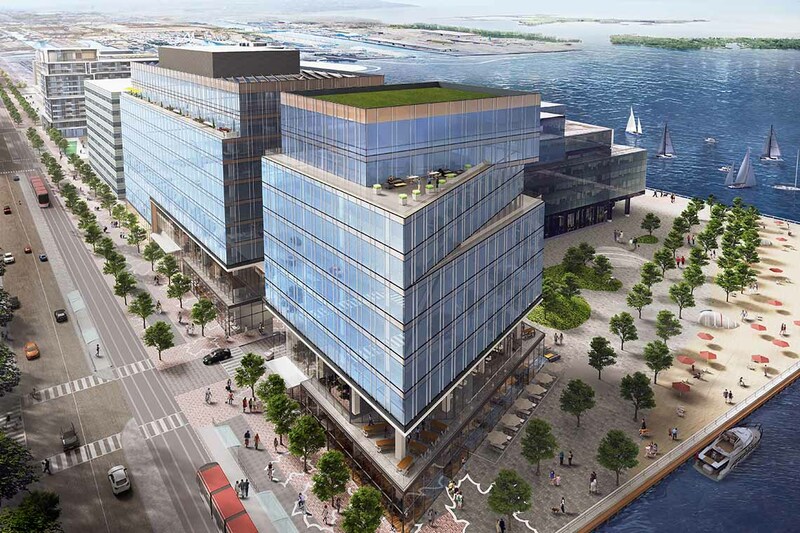 In partnership with MaRS, the university is in the final stages of securing a lease for 24,000 square feet of the Waterfront Innovation Centre in the heart of the city’s next innovation hot spot and just a stone’s throw from the proposed Sidewalk Toronto neighbourhood. “The University of Toronto is excited to partner with MaRS to help expand Toronto’s rapidly growing startup scene to the city’s waterfront,” said U of T President Meric Gertler, who is also a member of the Waterfront Toronto board. Construction on the centre, a project of Waterfront Toronto and developer Menkes, is expected to start this fall adjacent to Sugar Beach and Corus Entertainment. When it opens in 2021, the centre and its more than 3,000 employees will be surrounded by new developments stretching along the eastern lakefront, the city’s largest swath of undeveloped land. The Waterfront Innovation Centre marks the second time U of T and MaRS, two key innovation juggernauts in the city, have partnered on real estate. In 2015, U of T acquired four floors in the west tower of MaRS and took a 20-per-cent equity share in the building on the corner of College Street and University Avenue. It’s there that you’ll find JLABs, Uber, the Vector Institute for Artificial Intelligence, Medicine by Design, the Ted Rogers Centre for Heart Research, the Centre for Commercialization of Regenerative Medicine and SciNet. However, the MaRS west tower is now 99.8 per cent full and we have to “turn away entities, startups and companies wanting space there on a weekly basis,” Mabury said. It’s a common story across Toronto’s downtown core, where the vacancy rate is three per cent – a historic low. Space is also a pressing issue on the university’s downtown campus. The time is right to make the leap, Mabury said, noting it’s the only way to keep the city’s startup scene growing because the “market is just not delivering” the space needed for companies to scale. At U of T, “we see ourselves as facilitating that growth and scale,” he explained. “Many of these companies want to be associated with, or near to, the university to access the talent of faculty, staff and students . . . and to tap into the research powerhouse that we are, including our hospital partners. The Waterfront Innovation Centre will consist of two buildings. The U of T-MaRS space will be located on the second and third floors of the larger tower known as the HIVE. The building, which will feature state-of-the-art amenities including ultra high-speed broadband networks, is designed to support media and data-intensive industries. With a decade-long lease, and the option to potentially double in size at a later date, the MaRS-U of T partnership is helping bring long-term stability and anchor development in this new innovation corridor, Mabury said. That’s in addition to bringing much-needed assets to the table. These include world-leading researchers and proven entrepreneurship incubators that are magnets for attracting and developing talent in Toronto. The Waterfront Innovation Centre is just one of many developments U of T is eyeing to bolster innovation in Toronto, Mabury said, adding plans are in the works for U of T to build two new towers across from MaRS in the city’s Discovery District.